This week, the AnOther team are preoccupied with unusual pets. As well as the beautiful goat, cradled by Rachel Weisz on the cover of the new issue of AnOther Magazine, we are also very proud to welcome Audrey Hepburn and her adorable pet baby deer, Pippin to our regular The Pets column. When the British actress was making her 1959 film Green Mansions, directed by then-husband Mel Ferrer, the animal trainer on the set suggested that she take her on-screen sidekick, a baby deer, home with her so that he would learn to follow her. Audrey's inner calmness was perfect, and the deer thought she was her mother. 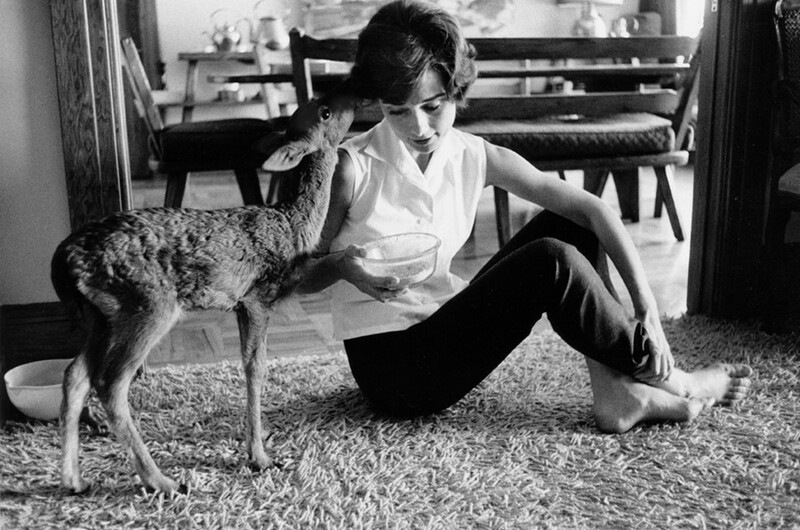 Nicknamed 'Ip', the deer would cuddle Audrey and accompany her to the supermarket in Beverley Hills. Hepburn's dog, a Yorkshire Terrier called Mr Famous (sadly, later killed in car accident) was very jealous of the new addition to the family. The fawn slept in a custom-made bathtub. Deer have lithe, compact bodies and long, powerful legs making them excellent jumpers and swimmers. They are cud-chewers and have a four-chambered stomach. Nearly all deer have a facial gland in front of each eye which contains a strongly scented phereomone, used to mark its home range. A doe generally has one or two fawns at a time and most are born with their fur covered with white spots, though in many species they lose these spots by the end of their first winter. Whilst it unusual for deer to be kept as pets (there are certain laws depending on where you live which prevent this), fawns can be kept indoors but as they grow older should be kept outdoors in an enclosure. Deer can be very loving pets if they are kept from a young age – spending a lot of time around deer makes them tame and very loving.